Lewis Hamilton’s 70th F1 victory might not be one he’ll look back on as a career standout, with Mercedes boosting the championship leader to the top step ahead of team-mate Valtteri Bottas, but as Formula 1 Managing Director, Motorsport Ross Brawn explains, team orders are an integral part of the sport, and with five races left and a maximum 125 points up for grabs, the decision to make the switch was the right one. In parc ferme after the Russian Grand Prix, it was noticeable that none of the three drivers looked particularly happy. Sebastian Vettel possibly had good cause, given that the result meant his title chances had slipped further away. However, Lewis Hamilton should have had every reason to celebrate, while Valtteri Bottas had just helped Mercedes score its third one-two finish of the season. I have found myself in this situation many times in the past and personally, I always believed the collective interest of the team comes before that of an individual driver. In may not be easily accepted by the fans, nor look good for the sport, and that is where the team have to judge the circumstances and make their decision. I can understand Bottas’ frustration, as he had a great weekend, demonstrating how well the Sochi track suits him, but team-orders are part of the sport. Also, it’s always better to apply them in a transparent manner, rather than trying to hide it, something we have seen sometimes in the past, which raised accusations of deception. It’s not the most attractive aspect of our sport, but it’s always been a part of it, good or bad, and it is better to have it in the open. Max Verstappen’s fifth place came as a result of one his best drives to date, with the added bonus of it coming on his 21st birthday. Forced to start from the back, because of yet another power unit penalty – something I’ll get back to in a moment – Max staged an incredible climb up the order which took him into the points after just three laps and into a podium position by lap 13, before taking the lead on lap 42. After his pit stop, Max rejoined in fifth but his new set of ultrasoft tyres failed to provide the expected boost in pace, and in the end he was forced to abandon pursuit of Kimi Räikönen. Until that point, though, it had been an amazing spectacle. Yes, his car was much quicker than those around him, but Max still had to pull off the passing moves and once again he proved to be among the best in the business of overtaking. It was thanks to him and Red Bull’s strategy that the final podium places remained in doubt until a dozen or so laps from the flag, given that Hamilton was definitely able to go quicker than the pace at which he was obliged to run when second to Verstappen. Having tried once to get past on track, Hamilton then wisely waited for the Dutchman to pit to build up a safety net, not so much over Bottas, but over Vettel. Belated birthday greetings to you Max and it was clear that you really enjoyed yourself on the day! It was another great weekend for Charles Leclerc, who richly deserved to win the best-of-the-rest race. The Monegasque youngster was the only driver from outside the top three teams to complete the full 53 laps of the Russian Grand Prix, even if he was 80 seconds behind the winner. Charles demonstrated plenty of determination at the start and executed a superb passing move on Haas’ Kevin Magnussen. He also did a good job of managing his tyres. This seventh place is his second best result, following his P6 finish in Baku, and was well won, as it owed nothing to help from others. Leclerc has had seven points finishes and made four appearances in Q3 in the first 16 races of his Formula 1 career, and all at the wheel of a car that is clearly not one of the very best, though the Alfa Romeo-branded Sauber is clearly improving. What is really impressive is the maturity Charles has shown in fitting in immediately at this the highest level of the sport, as well as in dealing with all the noise surrounding the news of his move to Ferrari starting next year. His performance in Sochi has proved to the public, and any critics, that the Scuderia has made the right choice. Keep doing what you’re doing, lad. The Sochi weekend once again brought to the attention of spectators and those in the sport the topic of penalties. There were so many over the three days that the Chief Steward decided to put out a press release explaining how the grid had been decided. I think that all concerned have to consider the need to find a different solution to manage penalties relating to changing mechanical components in excess of the limits laid down by the regulations, so that it does not penalise the drivers and then spoil the show. It definitely doesn’t help, as we saw in qualifying on Saturday, when five of the 15 drivers didn’t take part in Q2 given there was no sense in running as many were going to start from the back of the grid anyway, as was the case with the Red Bulls and Gasly. In this case, it’s better to aim for the sixth row and have a free tyre choice for the start, as Renault chose to do. It definitely is not good for the show when you see drivers braking a few metres from the finish line so as to not set a time good enough to get to Q3 and to have to use the tyres with which they set that time in Q2 for the start. Those of us who feel that Formula 1’s greatest asset is its fans, have to look at the rules to ensure they are comprehensible and produce the best possible show. For example, the qualifying format has now been well established for several years – apart from the unsuccessful experiment at the start of 2016 – but that doesn’t mean we shouldn’t look at ways of improving it, such as the idea recently put forward at the last Strategy Group meeting, to split qualifying into four parts rather than the current three. No agreement was reached on introducing it for 2019 but the seeds of discussion were planted, now we have to make sure they grow well. 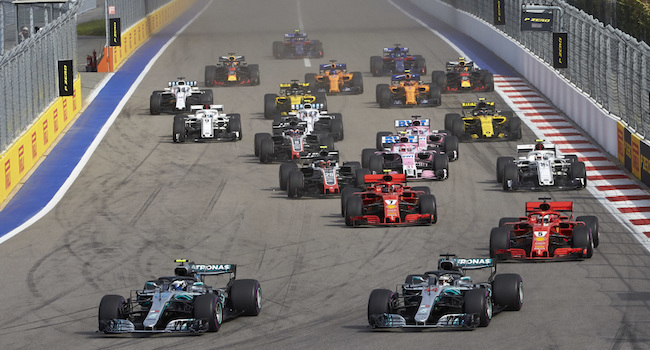 This was only the fifth Russian Grand Prix but it’s becoming one of the most important sports events of this huge country. Over 150,000 spectators attended over the weekend, which was an increase of no less than 72% in ticket sales revenues. It’s an encouraging figure and a significant reward for all the hard work carried out by the promoter to come up with a great show for the fans. What certainly helped was the return of the two support series, F2 and GP3, which had not raced here since 2015. The four races in these two categories were a great show, met with enthusiasm by the crowds and helped by the presence of two Russian drivers, Artem Markelov in Formula 2 and Nikita Mazepin in GP3, even if they didn’t have much luck on home soil. And in Formula 1 there was another local hero in the shape of Sergey Sirotkin, who will be joined next year by Daniil Kvyat who we learned is to return to race Toro Rosso in 2019. This band of Russian drivers is further proof that motorsport is growing in popularity in Russia, a country without the strong tradition of other European countries. And there’s nothing better than global events like a Grand Prix to promote the sport.